Grace Hopper Open Source Day: register now! Are you planning to attend this year’s Grace Hopper Celebration of Women in Computing, taking place on October 2-5 in Minneapolis, Minnesota, US? Created by the Anita Borg Institute, this annual conference is named for Rear Admiral Grace Murray Hopper, a pioneer in computing who worked on the first large-scale commercial computer—UNIVAC—and led the team that created the COBOL programming language. Each year, Grace Hopper brings together more than 3,000 women for a week of technical presentations, hands on labs, skill building workshops and networking events. If you’ve never attended Grace Hopper, I can’t recommend it to you highly enough; all are welcome, though the conference is geared towards female technologists in industry and academia. You can find registration details on the conference website. If you’re now convinced that you should join us at the Grace Hopper Conference, consider also joining us for Grace Hopper Open Source Day. Taking place on the final day of the conference, this day long hackathon was created to give attendees of the conference and some of our friends from the local community the opportunity to code, network, build their portfolios and contribute to the greater social good. 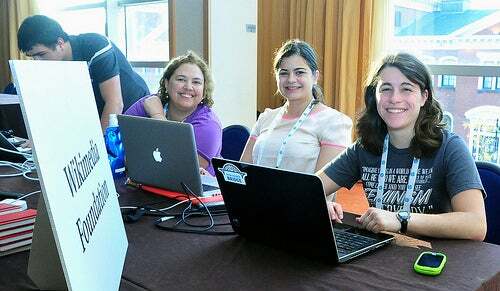 The event had its genesis in the Code-a-thon for Humanity held at the 2010 Grace Hopper Celebration of Women in Computing Conference in Atlanta, Georgia, where more than fifty women gathered contribute to humanitarian focused open source projects. From that initial event, Grace Hopper Open Source Day has grown greatly, welcoming more than 200 women at each gathering to collaborate on a variety of projects. We’ll be working with a several open source projects that will offer mentoring and coaching on-site to participants, including a list of bite sized tasks that you and your new found friends can work on and finish during the course of the hackathon. While all participating organizations have not yet been announced, we’ll be working with a variety of organizations creating code for social good, including an opportunity to give back to the Minneapolis community by writing code for local projects. You can find more information about the participating organizations and Grace Hopper Open Source Day in the 2013 Event FAQ. With so many great sessions on offer at Grace Hopper, you may wonder why you’d like to attend Grace Hopper Open Source Day. The answer is simple: Free and Open Source Software (FOSS) adoption and usage is becoming widespread and many employment opportunities require experience on FOSS projects. It can be daunting to know how to contribute to an existing FOSS project or release your individual software tool or application under an open source license. We hope to help attendees gain more experience in these areas, as well as the chance to network with more like-minded technical women and to encourage you to take your first steps as an open source contributor. Signing up for Grace Hopper Open Source Day requires two easy steps: select Grace Hopper Open Source Day as an event you’ll attend when registering for the Grace Hopper Conference. You’ll receive further details on signing up to participate with a specific mentoring project in your registration confirmation email. If you have any questions about the process, check out our 2013 Event FAQ or email the organizing committee. Speaking as a co-organizer of the Code-a-thon for Humanity that blossomed into Grace Hopper Open Source Day and a committee participant each year since that inaugural gathering, I cannot encourage folks enough to attend. You’ll have the opportunity to work with knowledgeable and approachable mentors and gain the new skills you need to contribute to open source projects. Plus, you’ll make a ton of new friends. How much more appropriate to use Grace Hopper to celebrate/encourage women in computing than the overrated narcissistic lunatic Ada Lovelace. As an educator who is forever dismayed that our courses only attract around 20% female students I heartily support this initiative.